The festival of Maha Shiva-ratri, the ‘Night of Shiva’, is celebrated throughout India and the world by sincere devotees of Shiva. In Los Angeles we will privately celebrate Maha Shiva-ratri a day earlier than the Vedic calendar, according to Kashmir Shaiva philosophy. Swamiji suggested to spend the night meditating as long as one wishes, followed by a light meal before retiring for bed. Wishing you a Happy Maha Shiva Ratri! 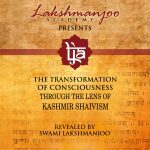 In this video excerpt, Swami Lakshmanjoo reveals the real meaning of Śiva rātrī, the dark night of Shiva . . . but first he explains another very beautiful verse about the greatness of Lord Śiva.
. . . mahātmanām, the rahasyā, the secret of Shaivism – in the beginning of Kālī Yuga – pūrvam āsana mahātmanāṁ, ṛṣīnāṁ vaktra kuhare,1 the secret of Shaivism was residing in their heart. Teṣv eva ānugraha, they would explain it without writing [it down]. 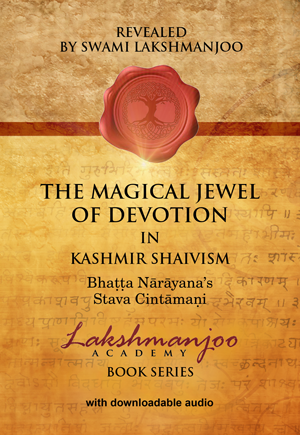 They didn’t write [down] the theory of Shaivism at all; it was in their brain. They would explain it, bas, and it would penetrate those to whom it was explained. And they were the same, i.e., they became the same. Dhyāyet-nityaṁ maheśaṁ rajata-girinibaṁ cāru-candra-avātaṁsaṁ. Dhyāyet, you should concentrate, dhyāyet nityam, you should concentrate, nityam, ‘always’. When you are likely to meditate, and when you are not meditating, i.e., when you are sleeping, when you are snoring, when you are walking, when you are talking – nityam means that. Always you should . . .
. . . dhyāyet, you should concentrate on that – Maheśaṁ – [the one] who is the Lord of Lords. 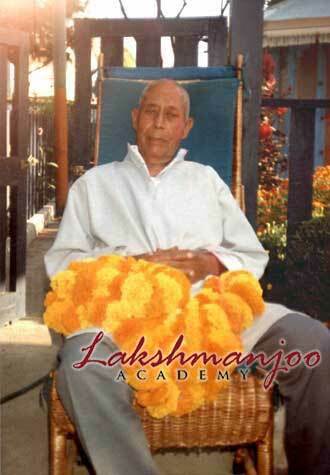 Lord of Lords is Maheśaṁ. And he is rajata-giri-nibam, he is so big, you can’t imagine how big he is. His body is so big he is just like the mountain, a big mountain of silver, white silver. The big mountain of white silver, it is his body. From kalāgnirudra to śāntātītā kalā,3 he is so big! What can ordinary people do before him? – They are nothing! And you should recite that dhyāyet-nityaṁ maheśaṁ rajatagirinibaṁ. And cāru-candra avātaṁsam, and, chāru means very beautiful, candra means the candra kala4, is avātaṁsam, is on his forehead, it is decorated on his forehead. And that candrama is called meye-candrama, i.e. the objective world. All objective world. Whatever is existing, whatever is not existing – that is objective world – this whole objective world is candra. And he has put that on his forehead. It is his avātaṁsam. Avātaṁsam means crown, just like crown. So he has accepted this whole universe as his own crown. So it is not separated from his Being. ratnā kalpojjvalāṅgaṁ; ujjvalāṅgam . . .
[And] his body is ujjvala, ‘shining, glittering’; this white body, just like this white body, it is glittering with sparks shining from that whiteness. You know sparks? “shh . . . shh . . . shh . . . shh . . .” like this. Ratnā kalpa-ujjvalāngaṁ, all ratnās, all jewellery is shining, is producing from that, i.e. from that body (of Lord Śiva). You should think of Lord Śiva like this. Ratnā kalpo-jjvalāngaṁ paraśu mṛga varābhīti hastaṁ, in hand he has got paraśu; paraśu means hatchet (axe). Hatchet is for those who are sinners, cut them into two. Finish them altogether – paraśu. Mṛga (deer), and he has got mṛga; mṛga means temptation. He has created temptation also for those (people), just to see if they are tempted or not. Or [to see] if they remain in their own position. But some don’t remain in their own position. They are tempted. He has created temptation also in this world. That is mṛga; mṛga means temptation. Mṛga is that deer. Deer is very beautiful . . .
SWAMIJI: . . . just like Sītā. Because Sītā was tempted, and this temptation was just a trial in which she didn’t succeed. She was tempted. So, temptation should not be accepted. If one goes in samādhi, perfect samādhi, and all gods and goddesses come before him, and pay their respects before him, and offer him – “This you have obtained by your samādhi, please accept this . . . please accept this offering, please accept our offering . . . please accept,” – saṁga-smaya-ākaraṇa, you should think, one should think at that time, “No! I won’t accept it. It is only temptation, I should not have this.” [And] he should remain in that consciousness of Lord Śiva. If he does not do that, pūrṇar-anịṣta-prasaṅgat, he will fall again. So, this is a test for him. From that test he must come out. DENISE: What kind of things do the gods and the goddesses offer that person? You should not accept it! I can go by thought only! Why should I accept this . . . this kind of machinery! Pūrṇar-anịṣta-prasaṅgat, he will fall again in this world. DENISE: Of māyā . . . right? He has got three eyes, one is objective, one is subjective and one is cognitive. This whole cognitive world, this whole objective world and this whole subjective world are his three eyes, they are not separated from each other. Object, subject and cognition are the same. Lord Śiva is residing equally in these. Object is not inferior, and subjective consciousness is not superior, they are in the same level, in that supreme God consciousness where I reside. DENISE: Objective, subjective and cognitive are the same.
. . . trinetraṁ . . . . . maheśaṁ rajatagirinibaṁ cārucandrāvātaṁsaṁ / ratnā kalpojjvalān̄gaṁ paraśu mṛga-varā- bhīti-hastaṁ . . . . . . . .
Padmāsīnam, he is padmāsīnam, i.e. he is padmā, padmāsīnam means he is seated in lotus; lotus from below and another lotus above, from this way. He is residing in that lotus. One lotus [from below] is Kalāgni-rudra and another lotus [from above] is śāntātītā kala – he is there seated; one lotus is from above . . .
How great is he! What can these demons do before him? Padmāsīnam samantāt stutam amaragaṇair; samantāt stutam amaragaṇair, all those who are immortals, (immortals means gods, goddesses, Indra, Śiva, Nārāyaṇa), all those, stutam amaragaṇair, they all pray and sing the songs of this great Being, i.e. Parabhairava7. Padmāsīnam samantāt stutam amaragaṇair . . . vyāghra kṛttiṁ vasānaṁ; vyāghra kṛttiṁ vasānaṁ, he has a loin cloth [made] of vyāghra. Vyāghra means this lion skin, petticoat. He has got petticoat of lion skin. It means he is the “Lion of Lions.” Nobody can tolerate that. And you know the measurement of that body. The measurement of the body of Lord Śiva is from Kalāgnirudra to Śāntātītā kala – is so great. What is America, and what is Srinagar, and what is there? It is all there! It is nothing. JOHN: So, what is the meaning of Śiva rātri? SWAMIJI: Śiva rātri is very inferior! JOHN: What is the importance of that in terms of Lord Śiva? SWAMIJI: Rātri . . . Śiva rātri; it is white night, it is not dark night! Śiva rātri means Śiva means white, rātri means night. It is that night which is bright night. It is white night, it is not dark night. It is not black night. Śiva rātri means white night, where there is glamour, where there is light. Actually at night you feel darkness. Śiva rātri is not that. Śiva rātri is where this night is white, brilliant, glittering. All things are visible. There is no need of torch, there is no need of lamps, bulbs, or voltage lamps, or whatever it is . . . [whatever] you can try. It is more than that. And in other words it is Śiva rātri. Śiva rātri means that night where you are graced with the śaktipāta of Lord Śiva. In that night he bestows śaktipāta, tīvra-tīvra śaktipāta9 is bestowed to the one who deserves. So this is today’s lecture . . . right! 2. In this recitation Swamiji recites vandhyam (to salute reverently) in place of bījam. 3. Kalāgnirudra bhuvana is the lowest of the 118 worlds, and the highest is the abode of śāntātītā kalā. 4. Lord Śiva is commonly depicted with the crescent moon on his forehead. 5. This quote is from the Vibhūti Pāda of Patañjali’s Yoga Sutras. 6. Here Swamiji recites trīnetram (with three eyes) in place of prasannam. 7. Paramaśiva – supreme Śiva. 8. In his presentation Swamiji did not translate the last line of this verse. The classical sense of the last line is: I pay reverence (vandhyam) to Him who has five faces (pañca vaktram) and three eyes (trīnetram), and who existed before the universe was created (viśvādyam), and who vanquishes all fears and agonies (nikhil-abhaya-haram). 9. Tīvra-tīvra śaktipāta is the most intense form of grace. 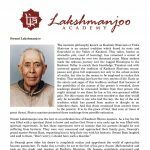 See Kashmir Shaivism, The Secret Supreme, Chapter 10.66. All Content is subject to Copyright © John Hughes.